West Australian Drag Racing fans were starved of entertainment prior to 1968 and prior to Drag Racing being taken over by the 1320 Drag Club, Prior to this, Drag Racing fell under the control of the WA Sporting Car Club. 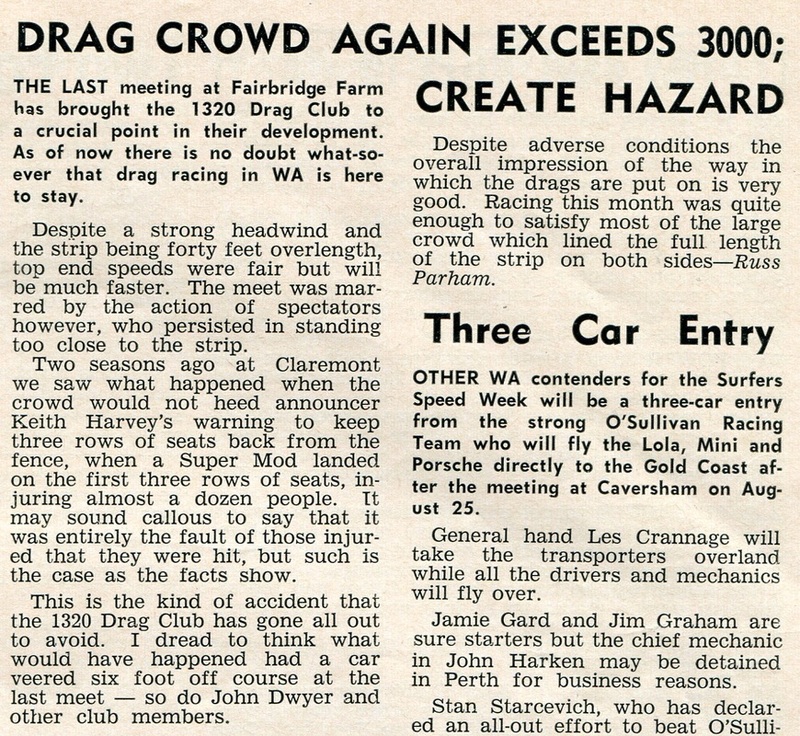 The first Fairbridge drag racing meeting held by the Perth based club, The 1320 Drag Club was held in March of 1968, The meeting was restricted to members only, The problem was that around seven hundred spectators also turned out, This was a major headache for the club as they had not yet organised any spectator safety fencing or a PA system to control the public, Entry to the venue was along the race strip into the path of the on coming drag cars. The second meeting held one month later was no different, this time the spectators had swelled to around one thousand, five hundred, Competitor numbers had also increased, The 1320 club were on a winner Drag Racing had arrived in the West. By the third meeting in August spectator numbers had increased to around three thousand and everyone was concerned out there safety and the fear of a major accident and the loss of lives. At this point in time the clubs whole focus was to upgrade the venue to cater for the increasing competitors and crowds, The strip was to be resurfaced to cater for faster cars, A dedicated entry to the spectator area as well as spectator fencing to keep the public in safe viewing areas, With there future development plans in hand the club set up a meeting with the land owner, The land owner had however there own plans for the club, "Get Out" this saw the end of Drag Racing at Fairbridge Farm. The 1320 Club although disappointed, knew they were on a winner with there sport. The club then approached two business man with the view of buying land and building a new venue in the area, This would be the building of Ravenswood Raceway.